Located 5,900 light years away toward the deep Southern constellation Centaurus lies a large beautiful nebula, known as the Running Chicken Nebula or λ Centauri Nebula. 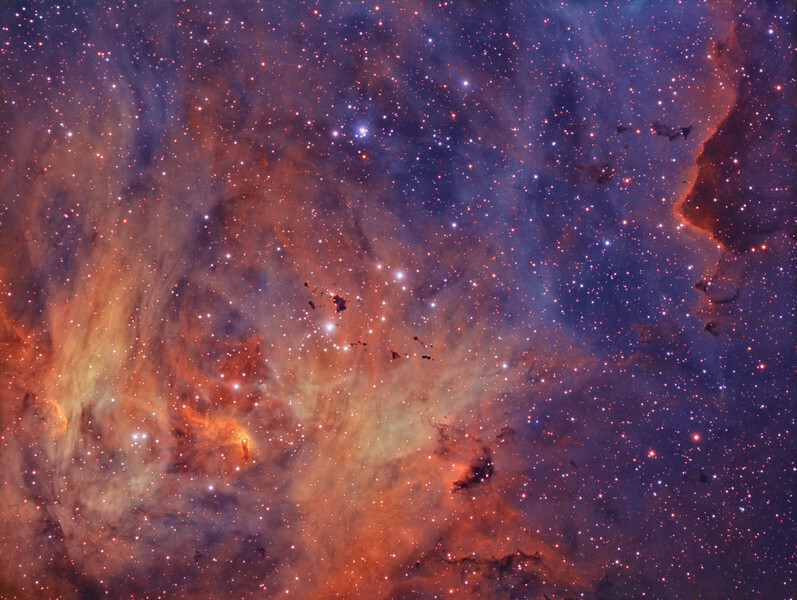 The region includes IC 2944, IC 2948 and fainter IC 2872 nearby. IC 2948 is the brightest part of the nebula, while IC 2944 is a cluster of stars with surrounding nebulosity near the star λ Centauri. The intense light from stars in the young open cluster cause the surrounding gas to glow with a magenta hue from emission lines of ionised Hydrogen atoms. In the centre of the image, seemingly suspended against a dramatic backdrop of glowing gas, is a group of Bok globules; dark dense collapsing patches of gas and dust where new stars are frequently born. Discovered by South African astronomer A. David Thackeray in 1950, the globules in IC 2944 are now known as Thackeray's Globules and are a favourite target for backyard astrophotographers and large professional telescopes alike. The largest globule is actually two separate clouds that overlap slightly as seen from our vantage point. While they appear small in the context of the grand nebula, these overlapping globules are each 1.4 light years across and together they contain more than 15 times the mass of our Sun. No star formation has been observed in Thackeray's Globules but young stars may yet emerge from the clouds in future as their light is not visible until their radiation pressure blows off the surrounding cloud.